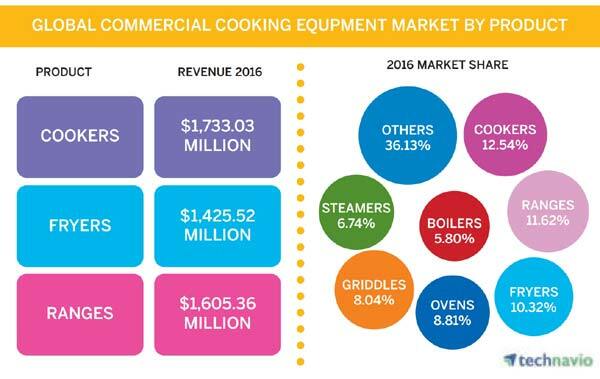 According to the latest market study released by Technavio, the global commercial cooking equipment market is projected to grow to USD 18,960.5 million by 2021, at a CAGR of nearly seven per cent over the forecast period. Global commercial cooking equipment market is projected to grow to US$ 18,960.5 million by 2021. Commercial kitchen equipment refers to appliances with electric or gas heating sources that are used in commercial kitchens. Currently, the growing preference towards energy efficient ENERGY STAR certified commercial equipment is encouraging consumers to upgrade their equipment, thereby driving the market growth. The need for energy-efficient cooking equipment is growing from food establishments around the globe and manufacturers are also coming up with technologies to be certified under ENERGY STAR. Moreover, the standard-sized fryers under ENERGY STAR certification are about 30 per cent more energy efficient compared to the standard variants. Energy-efficient fryers provide shorter cook time and increased production rates through enhanced burners, and heat exchanger designs. Similarly, commercial gas convection ovens with ENERGY STAR certification are over 45 per cent energy-efficient than the ordinary models. For example, G S Blodgett’s commercial convection ovens are certified by ENERGY STAR with being 50 per cent more energy-efficient than regular models. A key trend that is anticipated to gain traction in the global commercial cooking equipment market is the growing demand for certified equipment. The food service establishments are concentrating on purchasing certified commercial cooking equipment for food safety and protection of the equipment. This, in turn, has led the commercial vendors to enlist their products under numerous certifying companies. For example, NSF certifies the equipment provided in the food service industry for the safety of food and UL is a company that certifies the product safety dealing with equipment design, electrical, materials, components, and manufacturing. Moreover, vendors like Star Manufacturing International and Waring offer commercial panini grills that are certified by both NSF and UL. Commercial ovens are one of the most widely adopted types of cooking equipment for various cooking applications and reheating precooked foods. The key vendors in the market segment include G S Blodgett, Garland Group, and TurboChef Technologies. Some of the commonly used commercial ovens include convection ovens, conveyor ovens, deck ovens, brick ovens, combi-ovens, rotisserie ovens, and microwave ovens. These are extensively used in various food service establishments, with manufacturers constantly focusing on redefining their oven technologies. Commercial fryers are used to prepare fried foods like potato chips, onion rings, doughnuts, and fried fish, chicken, and shrimps. The frying time and oil temperature largely depend on the type of food, the size of the fryer, and the nature of the food establishment. Based on the source of heat, commercial fryers are categorised into electric and gas fryers, where a gas fryer uses a natural gas flame as a heat source, and the electric fryer uses electric heating elements. Some of the key vendors that offer commercial fryers in the global market include Frymaster, Imperial Commercial Cooking Equipment, Henny Penny, and PITCO. Commercial broilers are mainly segmented into electric and gas variants as per the heat source. Broilers are used to prepare vegetables, steaks, and other meat preparations, and are provided with over-fired and under-fired heating elements. Manufacturers of commercial broilers are currently focusing on adding improved features to ensure consistent cooking and enhance the quality of the food. Commercial broilers include charbroilers, salamander broilers, and cheese melters. Technavio is a leading global technology research and advisory company. The company develops over 2000 pieces of research every year, covering more than 500 technologies across 80 countries. Technavio has about 300 analysts globally who specialise in customised consulting and business research assignments across the latest leading edge technologies.